The geography of Shanghai is characterised by its location on the Yangtze River Delta on China’s east coast and its proximity to the Pacific Ocean via the East China Sea. The city is centred around the Huangpu River, a tributary of the Yangtze River, and extends outwards in all directions. The suburbs and satellite towns reach east to the East China Sea, north and west to Jiangsu Province, and south to Zhejiang Province over Hangzhou Bay. The vast majority of Shanghai’s 6,340 sq km (2,447.9 sq mi) of land area is flat, apart from a few hills in the southwest corner. This is due to its location on the alluvial plain of the Yangtze River Delta. The city has many rivers and lakes and is known for its rich water resources. Its coastal, riverside location and warm climate ensure easy access to China’s interior. Shanghai city proper is bisected by the Huangpu River and therefore can be split into two sides: Puxi, on the west side, is the historic centre of the city, and is a term used to describe as a whole the popular expat districts of Yangpu, Hongkou, Minhang, Zhabei, Putuo, Changning, Xuhui, Jing’an, Luwan and Huangpu. 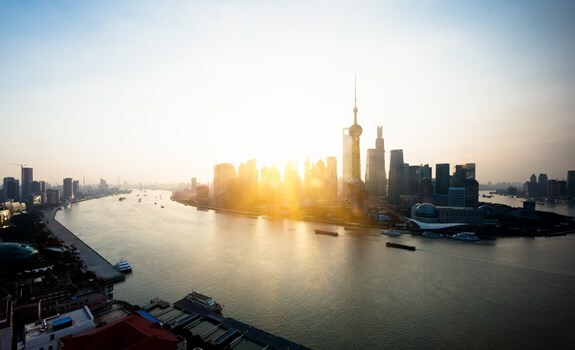 Pudong is located on the east side and is the location of Shanghai’s rapid development, including its much photographed new skyline and the Lujiazui financial district as well as the districts of Kangqiao and Jinqiao. The outer districts, or suburbs, surrounding the city proper, are Baoshan, Jiading, Jinshan, Songjiang, Qingpu, Nanhui, Fengxian and the rural easten part of Pudong. Shanghai’s only county, Chongming, is in the far north of the municipality and consists of the islands of Chongming, Changxing and Hengxia. Chongming Island is the site of one of the most ambitious green development projects in the world, which will see the formerly sleepy ‘rice bowl of Shanghai’ become home to more than 500,000 residents when complete. Numerous organic farms have sprung up on the island in recent years since a bridge was built connecting it with the mainland. The island is also the site of one of the largest migratory bird populations in China. Hongqiao is home to one of the world’s largest transportation hubs. Living in proximity to this area provides unmitigated access to high-speed rail and a world-class airport. Shanghai is a subtropical city located at 31°12 N 121°30 E / 31.2°N 121.5°E, roughly the same latitude as Savanna, Georgia in North America and Seville, Spain in Europe. It has four distinct seasons, with grey and cold winters, hot and humid summers and beautiful springs and autumns. Thanks to its proximity to the sea, Shanghai rarely sees snow, though it occasionally experiences sub-freezing temperatures. Summer temperatures can hit 40ºC, although the average high is around 32ºC. Most of Shanghai’s rain falls between April and September in three periods: spring rain, plum rain and autumn rain. The plum rain season, a phenomenon of the lower Yangtze region, is named after the fruit that ripens with its arrival between mid-June and early July. Typhoon season lasts from June to October with occasional strong winds and heavy rain.